We live in Southern California, dry weather and hot sun would cause damages to wooden gates and fences. If not kept up, the wood could be deteriorated. 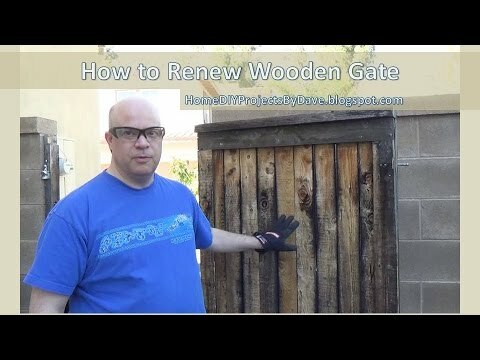 In this video, Dave will show us how he restored and resurface a wooden gate. Fix any possible wood damages. Protective gears such as eye protection goggles, hardware gloves, and industrial strength mask. Painting Supplies such as drop clothes, painter tapes, brushes, and paint rollers, and container for the paint. Last but not least, the Paint, for our project, we used the BEHR House and Fence Wood stain. This project took us about 4 hours to complete. I think,this idea is good enough but my acreage fencing is really strong and made of good quality materials by http://firstclassfencing.ca/. They too make Post and Rail Fence Calgary and in each and every case, they make the best. A few organizations are totally offering out of their picket wall, which are utilized as a part of the front, since they are so well known.